Crystal Light makes single-serve packets for flavoring water. It’s the same concept as Kool-Aid, except on a personal level. (Note that the Crystal Light and Kool-Aid brands are both owned by Kraft). How does Crystal Light’s powder turn ordinary water into a flavorful, sweet, and vibrantly colorful drinking experience for only a few calories? We don’t really want to know. They have to be doing something fake. For a long time, that’s what Crystal Light did. 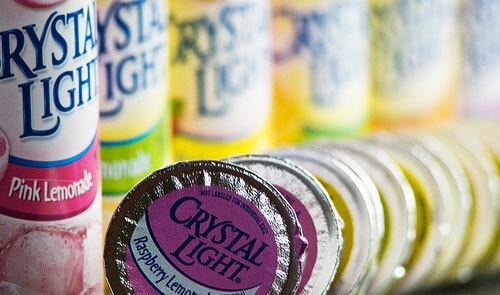 Consumer pressure forced Crystal Light to change their product lines. Today, there are three: Refreshing Flavors, Pure Flavors, and Enhanced Flavors. Refreshing Flavors is what Crystal Light used to offer. Enhanced Flavors is the same thing with micronutrients like antioxidants, and Pure Flavors is meant to be their all-natural version. Let’s compare Crystal Light’s ‘Pure’ lemonade, and Crystal Light’s sugar-free ‘Refreshing’ lemonade. Sugar, Citric Acid, Maltodextrin, Calcium Lactate, Contains Less Than 2% Of Natural Flavor, Rebiana (Truvia™ Brand Sweetener), Sodium Citrate, Magnesium Oxide, Oleoresin, Turmeric (For Color). Citric Acid (Provides Tartness), Potassium And Sodium Citrate (Control Acidity), Aspartame (Sweetener), Maltodextrin, Magnesium Oxide (Prevents Caking), Contains Less Than 2% Of Natural Flavor, Lemon Juice Solids, Acesulfame Potassium (Sweetener), Soy Lecithin, Artificial Color, Yellow 5 Lake, BHA (Preserves Freshness). The only noticeable difference are the sweetener (sugar vs. aspartame and acesulfame K) and coloring (turmeric vs. Yellow #5). I don’t really want to reward Crystal Light for swapping three ingredients and proclaiming the result ‘pure’. But at least there is an alternative.